To enable diagnostics and troubleshooting, all Retail components, which include clients such as the Retail Modern POS and server components such as Retail Server, log their events locally to Event Viewer (or to the browser developer tools console, in case of Retail Cloud POS). This article explains where to find events from Retail-specific components. 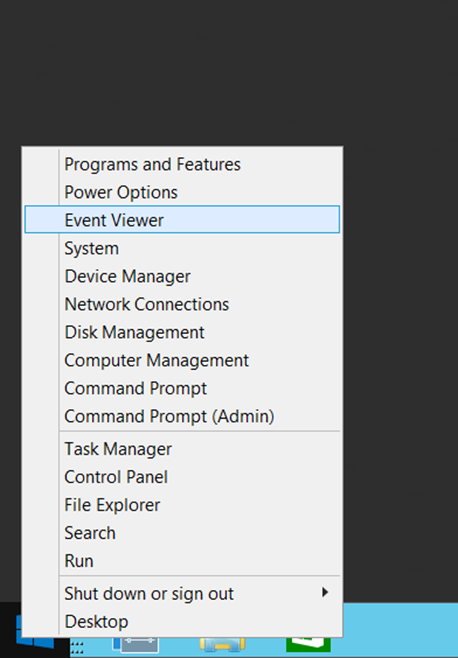 To start Event Viewer on a computer, right-click the Start button, and then click Event Viewer. 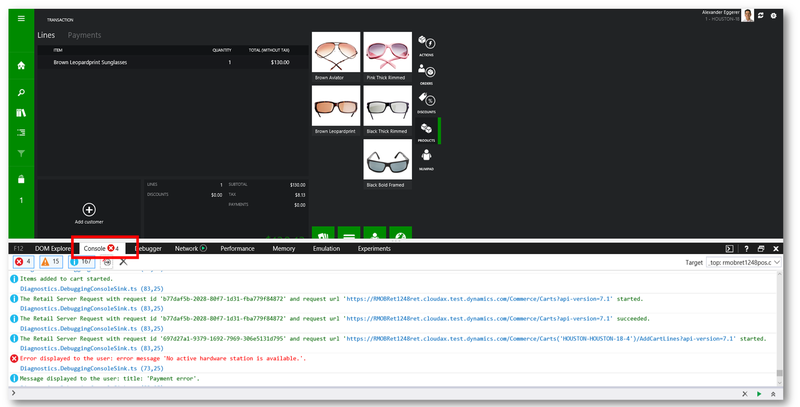 Commerce-RetailServer – This log contains events that are logged by the Retail Server components. Commerce-ModernPos – This log contains events that are logged by Retail Modern POS. These events include events from the TypeScript and C# (CRT) layer. Commerce-LoggingProvider – This log contains events that are logged by all other Retail components that aren't included in the list earlier in this article. Currently, some of the events that are logged by various Retail components are sent to debug event logs. These events are verbose events that are logged at very high rates and are useful only for detailed debugging scenarios. 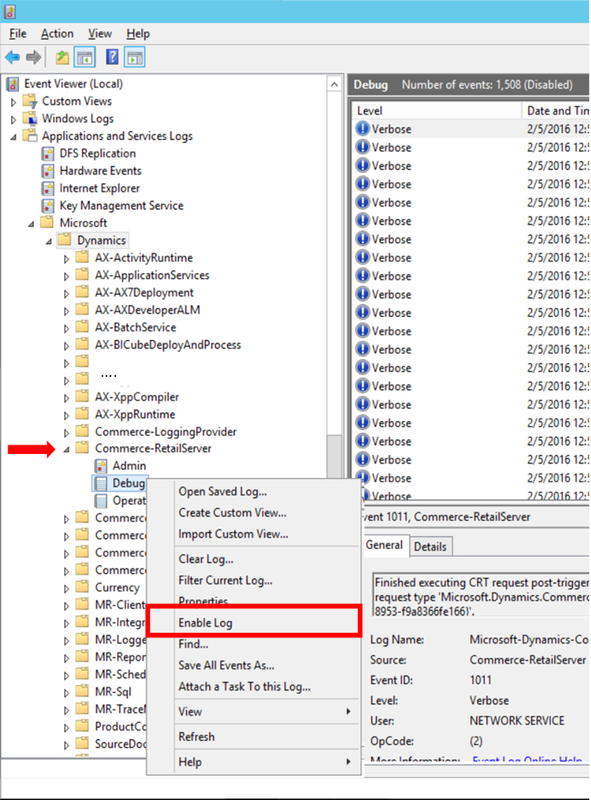 Follow this step to enable the debug event logs in Event Viewer. Right-click a debug log, and then click Enable Log. Because Retail Cloud POS is a browser-based component, you can use the browser developer tools console to view events for it. For information about the Microsoft browser developer tools console, see Using the Console to view errors and debug on MSDN. To use the browser developer tools for Retail Cloud POS, you must use a supported browser version. Start Internet Explorer or Microsoft Edge, and go to Retail Cloud POS. Press F12, and then click the Console tab. As you perform operations on Retail Cloud POS, events are logged in the console. You can filter by event severity to view events that have different severity levels. This sections explains how to correlate events from various Retail components. The diagram that follows shows the data flow between a point of sale (POS) client and the Retail Server. When a user starts a POS client, a new AppSessionID is generated. The AppSessionID is used to log every event that is instrumented in the POS client. All events that are logged to Event Viewer and App Insights have this ID. When a user signs in to a POS client, a new UserSessionID is generated. The UserSessionID is used to log every event that is instrumented in the POS client. All user events that are logged to Event Viewer have this ID. This ID is maintained for as long as the user is signed in. When the current user signs out and a new user sign in, a new UserSessionID is generated. Whenever a POS client makes a call to the Retail Server, the AppSessionID and UserSessionID are sent as headers. The Retail Server then logs an event for the incoming request (Event ID 5000). This event includes those two IDs and also an ActivityID. 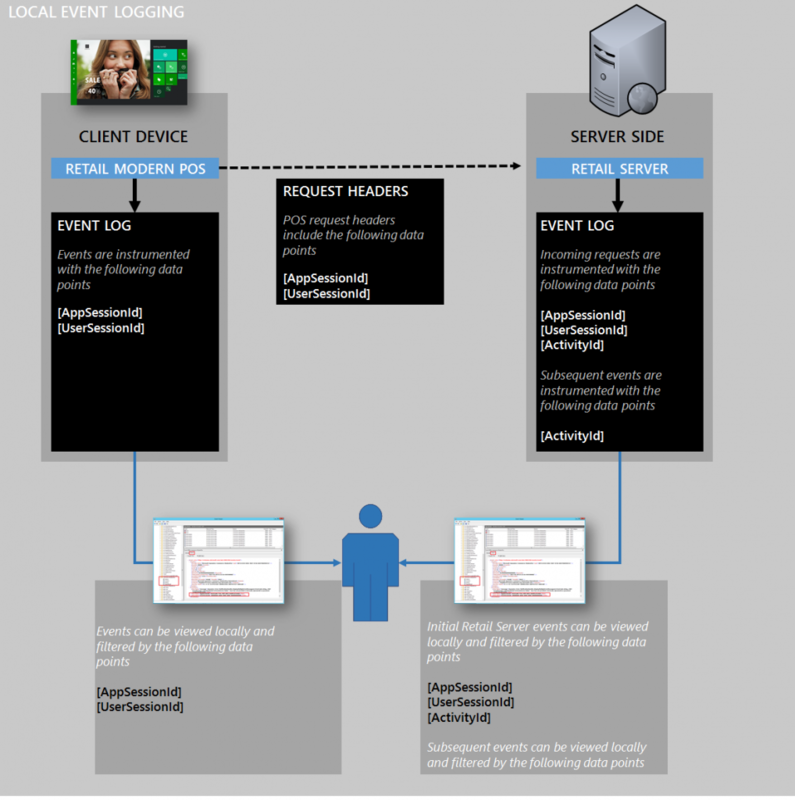 The ActivityID is then also used for all related Retail Server events. The AppSessionID, UserSessionID, and ActivityID are available in the event log where Retail Server is hosted. They are also available in LCS Log Search. Every event that is logged as part of a Retail Server request has the same ActivityID as the initial event that was logged for the initial incoming request event (Event ID 5000). These events are available in both Event Viewer and LCS Log Search. AppSessionID – A unique ID that is generated when the app is first started. It's included with every event that is logged from Retail Modern POS. UserSessionID – A unique ID that is generated when a user signs in to Retail Modern POS. It's included with every event that is logged from Retail Modern POS, for as long as the user remains signed in. When a new user signs in, a new UserSessionID is created. You can find the AppSessionID and UserSessionID values on the Details tab in Event Viewer on the machine where Retail Modern POS is installed. To correlate data for incoming Retail Server requests in Event Viewer, you must first enable the Analytic channel. To enable the Analytic channel, follow these steps. In Event Viewer, in the left pane, select Commerce-RetailServer. Click View > Enable Analytic and Debug log. 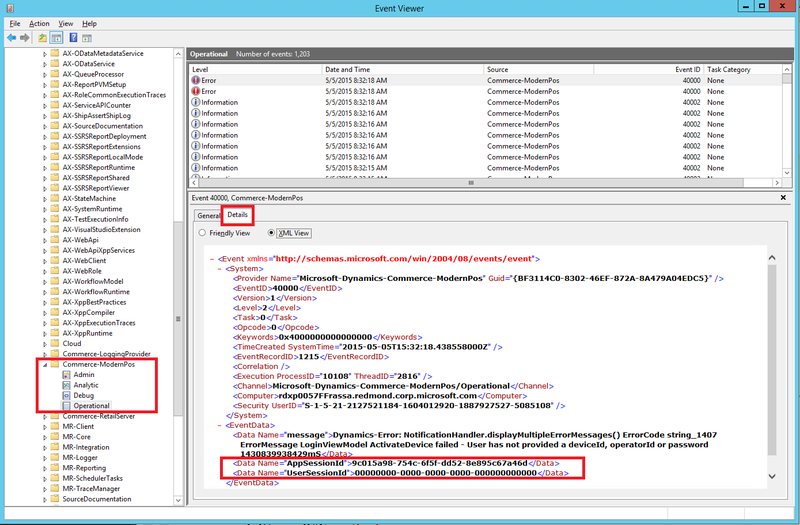 A new node for the Analytic channel appears under the Commerce-RetailServer logging provider. Right-click the Analytic node, and then click Enable log. In Event Viewer, all incoming Retail Server requests are logged to the Analytic channel of the Commerce-RetailServer source as event 5000. These events also have the AppSessionID and UserSessionID that were described earlier. Every event also has a unique ActivityID that is instrumented for every logged event for the same Retail Server request. To access LCS Log Search, follow these steps. Sign in by using the credentials that are associated with your project. On the project page, select the correct project. On the Project details page, select the correct environment. On the Environment details page, click Environment Monitoring. On the Environment monitoring page, click View raw logs.